By this interfaces and abstract class are same but still having lot differences like abstract class can have a constructor etc will discuss more before that we need to know about these Java 8 features of interfaces. Like normal class now with java 8 we can declare static methods in side a interface. Before Java 8 in interfaces we can and able to declare only abstract methods only. If we declare a method without abstract that will be treated as abstract by default. As we know all methods in interfaces are by default abstract methods. The class which is implementing this interface need to provide body / implementation for this abstract methods. Now with java 8 default methods we can add methods to interface without disturbing existing functionality. We can all these default methods by using interface name and also by using object of the class which is implementing. Yes we can override same method in class which is implementing this interface. Whatever the implementation in the two interfaces defined if we implementing two interfaces which are having a default method in both then compilation error will come if two methods have same signature. works fine if two methods have same name with different arguments. Check the below example programs to understand more. If we implement two interfaces which are having same method with same parameters then compilation error will occur. Duplicate default methods named "defMethod" with the parameters () and () are inherited from the types A and B. If we define two methods with different type of parameters then we can work with both interfaces. 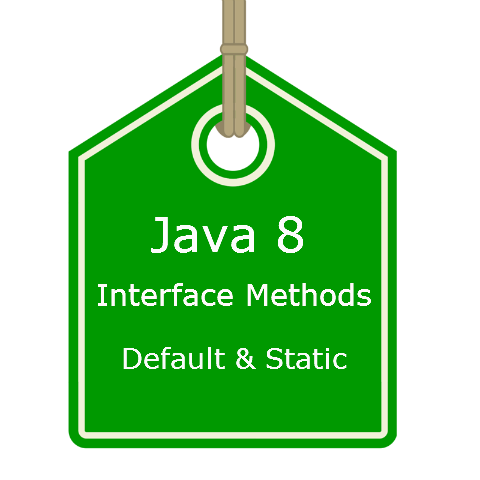 Another Java 8 interface method is static method. Now we can define static methods inside interface but we can not override these static methods.